This lunar maiden presides over the boundary between light and dark. What does she see in our world as she gazes down from her throne in the night sky? 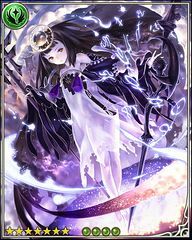 Up to 80% boost to Dark Elemental ATK based on number of front line allies' racesCalled "Types" in-game. 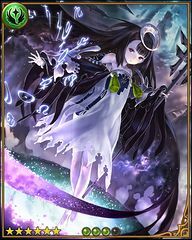 Up to 100% boost to Dark Elemental ATK based on number of front line allies' racesCalled "Types" in-game. 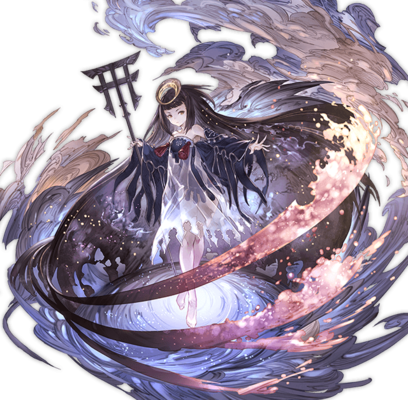 Massive dark DMG to all foes / Hit to all foes' light ATK / Slight chance for dark allies to gain Autorevive 9T9 turn cooldown. The Main Character counts as "Unknown". 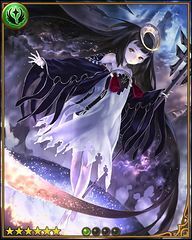 Tsukuyomi, or Tsukuyomi-no-Mikoto is the moon god in Shinto and Japanese mythology. Unlike in ancient Greek or Roman mythology, the Japanese moon deity is male. 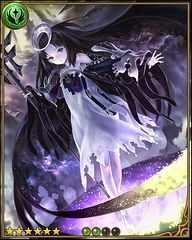 The top of the staff she uses resembles a torii. It is most commonly found at the entrance of or within a Shinto shrine, where it symbolically marks the transition from the mundane to sacred. This page was last modified on 4 February 2019, at 22:25.